Roll of Honour. Another young Jerseyman who has given his life for his Country is Thomas Peter Ounan, who died at his parents residence in Hue Street on Saturday after a long illness. This young man was a former member of St Pauls Boy Scouts and volunteered for service in the Royal Navy. He was for a considerable period on duty in one of the patrol boats but contracted a serious illness which he was unable to shake off and passed away as stated above, in his 23rd year. We tender the relatives our sincere sympathy in their bereavement. Funeral of Jersey Hero. The funeral of the late Thomas Peter Ounan who, as we have stated previously, died on Saturday aged 23 of illness contracted whilst serving on one of HM Ships took place yesterday. The cortege, which consisted of the glass panelled hearse and three mourning coaches, arrived at St Pauls Church at 2.30. The deceased had for several years been a member of the St Pauls Troop of Boy Scouts and some 20 lads of that unit, with representatives from the St Simons Troop, lined the pathway, the cortege passing through their ranks into the sacred edifice where the first portion of the burial service was impressively conducted by Reverend A Poynder. At the conclusion the cortege again passed through the ranks of Scouts, who also attended the church service. 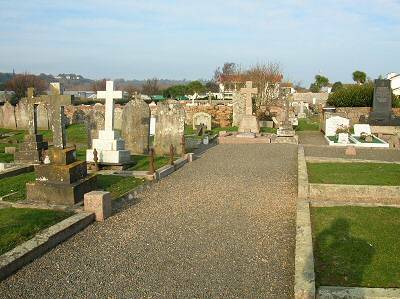 The interment was at La Croix Cemetery in Grouville, the Reverend Poynder reading the committal prayers. Son of Thomas Peter and Augustine Ounan. Born at St Helier, Jersey. 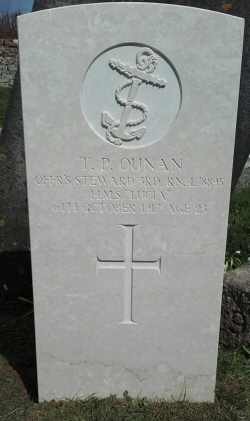 Died of illness contracted whilst serving in the Royal Navy, aged 23 years.